These two pictures was sent to me yesterday by Mr. Joel, the principal of Palalan Elementary School, Cagayan de Oro City, Philippines. These are the proofs that the money I sent the first time was put into place. That is why, my second donation will be scheduled on the 20th of this month and that will be for the flip flops of the children in this school. There are 157 children in the school but Mr. Joel will take pictures of those children that doesn't have flip flops. I can't afford with shoes yet, so flip flops are fine. I would personally like to thank MS. ROSE B. of Cebu City for the donors. I was totally blown away for the amount that you sent especially that it comes from the Philippines. Thank you so much. I was confused now though. Is the amount for the Palalan or Agusan? I posted two Paypal Logos (edited it today) at the top right corner to avoid confusion. I will just give your donation to Palalan Elem. School on June 20th. If there are available space for mural, it goes to that okay? OR, 50 pcs of flip flops for 50 kids, sounds great ha? Oh! I am so happy. May God bless you more. 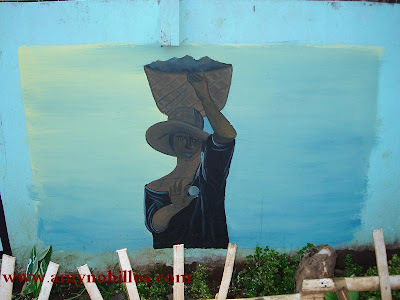 The photo above is the unfinished mural that I sponsored. The painter is a student that is why its off and on. I am already excited on the next project. Rest assured that I will post the pictures of the outcomes. I encourage you all to support the public schools in your community back home. These are my suggestions: Backpacks, pad of papers, pencils, erasers, sharpener, crayons, umbrella and raincoat. Those would delight them. God bless u ate amy. I hope you could help our school too. They require us a mural design in the school. Not so many people would like to help others now.. I'm so proud of you! hello Ms. Amy, God will bless you more for what you are doing.. Keep it up! how i wish i can donate too.. i don't have paypal and my blogs is not earning yet. 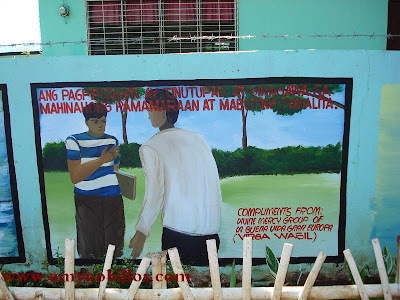 nakaka-inspire at nakaka-touch ang adbokasiya mo na maka tulong sa public school. masarap talaga pakiramdam na makatulong, simpleng bagay man, ito ay isang malaking biyaya sa kanila. God Bless you Amy. Good luck Amy and I hope God will continue to shower you with His blessings so you can continue for what you are doing. by the way, thanks for the visit. I did change already the URL you mentioned. thanks for the message too.